Ironveld plc, the owner of a High Purity Iron (“HPI”), Vanadium and Titanium project located on the Northern Limb of the Bushveld Complex in Limpopo Province, South Africa (the “Project”), is pleased to announce that it has raised £1.765 million before expenses through a placing of 88,250,000 new ordinary shares of 1p each at a price of 2p each. Placing to raise gross proceeds of £1.765 million through the issue of 88,250,000 Placing Shares at a price of 2p each. Proceeds of the Placing will be used for working capital and will put the Company on a strong footing as it seeks to realise its stated objective of becoming a producer of High Purity Iron, Vanadium and Titanium. The Company remains in advanced discussions with a number of funding providers for the potential acquisition of the Middelburg smelting facility. 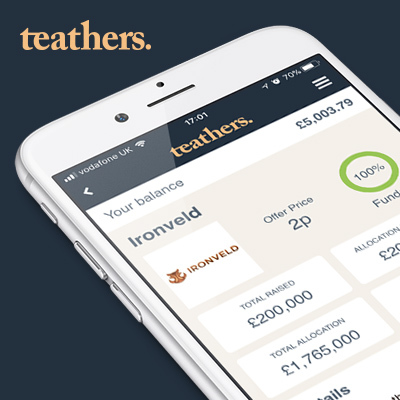 Peter Cox, CEO of Ironveld, said: “I am delighted with the continued support the Company has received from our shareholders. The proceeds from this fundraise will significantly strengthen our balance sheet and place us in a position of strength as we continue discussions to enable the Company to commence production of High Purity Iron, Vanadium and Titanium.” Potential acquisition of Middelburg smelting facility. In July of this year, the Company put down a R8.8m refundable deposit (the “Deposit”) towards the potential acquisition of the Middelburg smelting facility (the “Potential Acquisition”) in exchange for a period of exclusivity to conclude the Potential Acquisition. The Deposit remains in place as the Directors continue to negotiate funding arrangements. Whilst such discussions and the associated due diligence have taken longer than originally envisaged, the Directors remain confident of successfully concluding such arrangements to secure the funding for the necessary upgrades and refurbishment to allow for the processing of the Company’s own magnetite ore through the 7.5 MW smelter. The Group is the owner of a High Purity Iron, Vanadium and Titanium Project located in the Northern Limb of the Bushveld Complex in Limpopo Province, South Africa. The Definitive Feasibility Study published in April 2014 confirmed the Project’s viability to deliver an exceptionally high grade iron product, (“High Purity Iron”). The Project involves the Group mining its own VTM ore as feedstock for a 15 MW DC smelter which will produce High Purity Iron powder as well as vanadium and titanium products. The delivery of the Project remains a core objective of the Company and the Directors remain in discussions to secure the debt finance required for the Project. The Directors are of the opinion, having made due and careful enquiry, that, taking into account the net proceeds of the Placing, the working capital available to the Company is sufficient working capital for its present requirements, that is until 31 December 2018. Placing Summary. The Placing will raise, in aggregate, £1.765 million before expenses through the placing of, in aggregate, 88,250,000 new Ordinary Shares (the “Placing Shares”) at a price of 2p per share (the “Placing”). The Placing will comprise of a placing of 78,250,000 Placing Shares and 10,000,000 Placing Shares (the “First Placing Shares” and “Second Placing Shares” respectively). The Placing Shares to be issued will rank pari passu in all respects with the Company’s existing Ordinary Shares and, subject to shareholder approval, will represent approximately 15.5% of the Company’s enlarged issued share capital, following admission of the Placing Shares. Application has been made for the 78,250,000 First Placing Shares to be admitted to trading on the AIM Market of the London Stock Exchange (“AIM”) and it is expected that admission will take place and trading in the First Placing Shares will commence from 8:00am on 30 November 2017 (“First Admission”). Application has also been made for the 10,000,000 Second Placing Shares to be admitted to trading on AIM and it is expected that admission will take place and trading in the Second Placing Shares will commence from 8:00am on 12 December 2017 (“Second Admission”). Following the First Admission but before the Second Admission, the Company’s issued share capital will consist of 557,891,278 Ordinary Shares, with each Ordinary Share carrying the right to one vote. The Company does not hold any Ordinary Shares in treasury. This figure of 557,891,278 Ordinary Shares may therefore be used by shareholders in the Company, between the dates of First Admission and Second Admission, as the denominator for the calculations by which they will determine if they are required to notify their interest in, or a change in their interest in, the share capital of the Company under the FCA’s Disclosure Guidance and Transparency Rules (“DTRs”). Following the Second Admission, the Company’s issued share capital will consist of 567,891,278 Ordinary Shares, with each Ordinary Share carrying the right to one vote. The Company does not hold any Ordinary Shares in treasury. This figure of 567,891,278 Ordinary Shares may therefore be used by shareholders in the Company as the denominator for the calculations by which they will determine if they are required to notify their interest in, or a change in their interest in, the share capital of the Company under the DTRs.